Reminiscence. 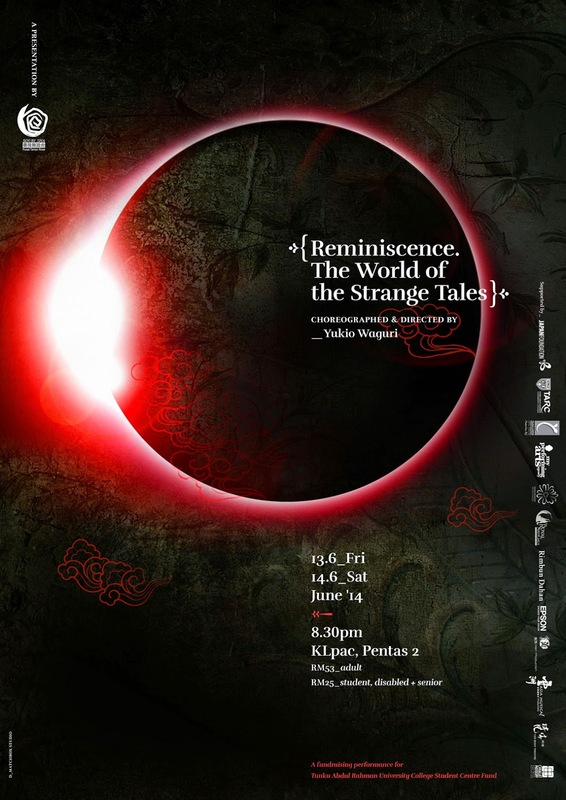 The World of the Strange Tales 《子夜。聊斋》, Butoh Full -length performance, Raise Fund for TARUC Student Trust Fund. Choreographed by Butoh mater Yukio Waguri. 13 & 14 June, klpac, Pentas 2, 8.30pm. Performers: Yukio Waguri, Suhaili Micheline, Foo Chiwei, Lim Siew Ling, Rithaudin Abdul Kadir, Rithaudin, Tan Bee Hung, Lee Choy Wan, Kohini Balasingam, Ling Hooi Meng, Nurulakmal Abdul Wahid, Ren Xin,Yeow Lai chee. The original author The Strange Tales Pu Songling (Qing Dynasty) said that maybe only the ghosts or the foxes in the dark forest can understand him well. Reminiscence. The World of the Strange Tales dance performance was choreographed, and directed by the acclaimed Butoh master Yukio Waguri from Japan, which based on the world-famous Chinese short story The Strange Tales. Master Waguri will also be performing on stage together with the local dancers! This performance is not only presenting the mystery world of ghosts and spirits, what most important thing is that through the series of the ghost stories, the choreographer and dancers are trying to explore the human nature, and projecting the real human society, revealing out of this world good and evil for the final liquidation , and hoping for a new life! This performance has been performed successfully in last year in Taiwan, Macau and Hong Kong as a tour. In addition, with the generous support from JKKN, Xi Yue Art & Cultural Creative Centre Japan Foundation, this performance was also held by Soubi Sha in a form of work-in-progress in Kuala Lumpur last year on the National Day under the circumstances of insufficient funds. However it was a big succeed presentation, which the performance received an enthusiastic responses from the audiences. And this year, it is honor of Soubi Sha to invite Master Waguri again and to present the full-length version in Kuala Lumpur! The performance has gathered local Malay, Chinese, and Indian dancers to perform together. Other than this, Master Waguri also combined Butoh, contemporary dance, and traditional dance elements in his creation in order to create a different style and new way of dance; this will be a major highlight of the performance. Maybe the audience is generally think that Butoh shows darkness , ugliness and grotesque side, but Reminiscence. The World of the Strange Tales is different, it tries to reflect the different faces of Butoh , also tries to explore the humanity from the darkness .And more importantly, how to find a light in a darkness , honesty, goodness and beauty. We sincerely hope the audiences will be able to absorb the love and beauty. Fund for Students Study Center new building construction .